Suitable for material with a humidity of less than 1% and a material hardness of max. 3,5 at the Mohs scale. 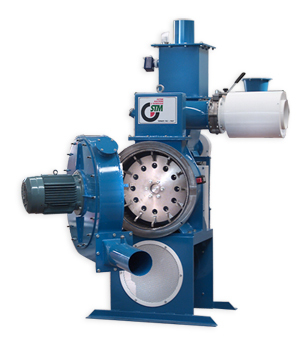 Suitable for virtually all fields where fine grinding is required: minerals, chemical, pharmaceutical, food etc. Material finesse d97 20 – 200 micron. The grinding process is achieved by the impact of the material particles against the grinding track. Working principle : A 360°rotating disc, utilizing the cylindrical grinding track of the grinding chamber, causes thematerial grinding and classifying process. 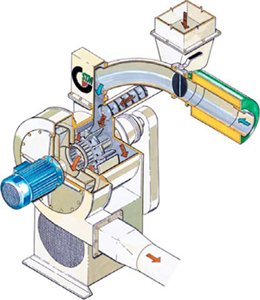 The material enters the single grinding chamber from the top, due to this design the material flows through the grinding and classifier wheel.